The PS sensor is an ultra-precision displacement sensor with high stability and high resolution, applying our unique capacitance technology. It has earned a good reputation as a displacement sensor with great versatility and price, being used for measuring various parameters such as displacement, vibration, shape, and position. Also, considering global environment, those products are Pb-free and conforms to RoHS standard. PS-Ⅲseries is the definitive version of PS sensor series, having various functions. Suitable not only as a laboratory tool for R&D but also as a built-in component for devices. 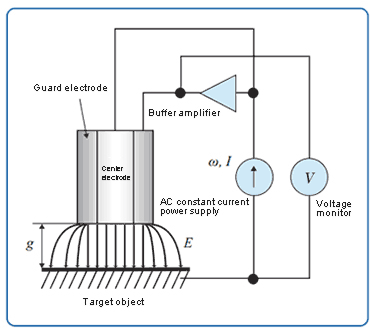 To achieve high linearity, parallel electric field is obtained at the center of electrode by equalizing the electric potential level of guard electrode and the center electrode. The PS-Ⅲ is equipped with various features like one-touch zero reset function, NEAR/FAR LED display, and multichannel operability, and it can be used for wide variety of applications.